Lets dig into the box. Underneath the last batch of tiles is a box filled with miniatures. Inside this box are two trays containing all of the minis in their own formed slots. This is nice, since it gives you a nice spot to put the minis in after they've all been painted. Let's crack that bad boy open! I'm really pleased with the minis, but there were some issues. But I'll get to that later on. The sculpts are all pretty solid, but one thing that disappoints me about this game is this; the models are all sorts of wonky scales. The Turtles seem small, while some of the thugs seem way too large. April and Casey's models are huge in comparison to the Turtles. It's just all over the place. If this were just another game, I may have been able to over look it. 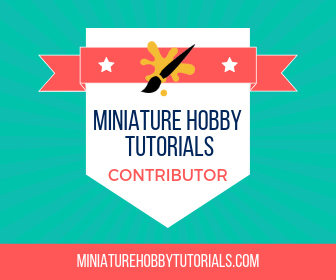 But as a guy who is used to tight scales across entire miniature ranges, this seems like a really unneeded mistake. With the models it's no to the rest of the contents! Adventure Comics, these are the mission books. Print #1, featuring Kevin Eastman's signature! All of the dice in the game, each Turtle, April, Splinter and Casey all have their own specific action dice. The white and black dice are combat dice. Round Tracker Bookmark, Turtles side. Turtle hero cards, with Eastman Turtle art. April, Splinter and Casey hero cards. Casey, April, Woody and Master Splinter Ally cards. Kevin Eastman, Fugitoid and Angel ally cards. Master Shredder and Ultimate Shredder villain cards. Alopex, Karai and Old Hob villain cards. Bebop, Rocksteady and Mouser villain cards. Villain cards for all of the minions. Terrain cards for everything that needs terrain rules. The villain cards for the villain deck. These are mixed together, depending on scenario. Kickstarter tile side 2 of Kevin Eastman's studio for the Save the Studio scenario. That's everything from the box! Overall, I am pleased with the boards, tokens and rule books. The books all seem easy to follow and laid out well. The Kickstarter book has an issue with the Bebop and Rocksteady missions though and seems to be a reprint of a mission in Book 2 of the main missions books. One of my Mouser miniatures is missing the top part of its head and Super Shredder is missing a blade on one of his shoulders. So, if you're still waiting on your copy of TMNT to arrive, make sure to check it all out for mistakes. IDW has announced the email to contact them for mistakes/missing pieces on the Kickstarter pages, but expect at least a week for your turn in line. 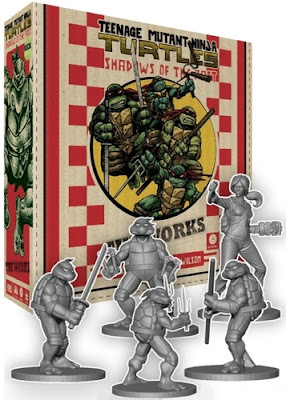 Either way, I am really pleased with TMNT: Shadows of the Past and can't wait to get it to the table.